Panoramic view of Yokohama, Kanagawa Prefecture. The two buildings in center left form Yokohama Station, a terminal station on Japan’s very first railroad. 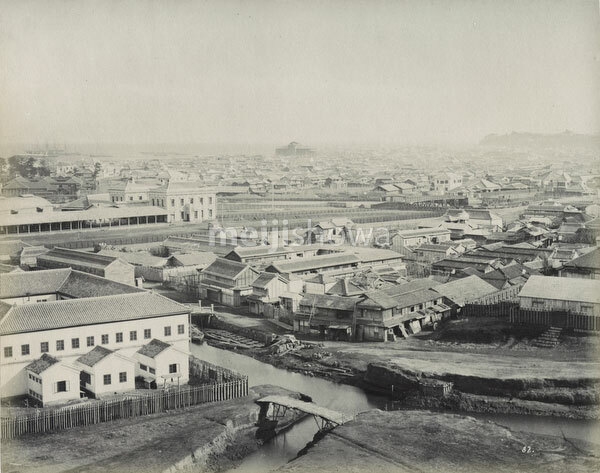 It was opened on June 12, 1872 (Meiji 5). The station was designed by American architect Richard P. Bridgens (リチャード・ブリジェンス, 1819 -1891). Tentatively attributed to Shuzaburo Usui because of the style of the negative number.